One of the world's most remarkable destinations! Ramada Eco Beach Resort is a multi award-winning eco resort set amongst the pristine and untouched Kimberley environment. 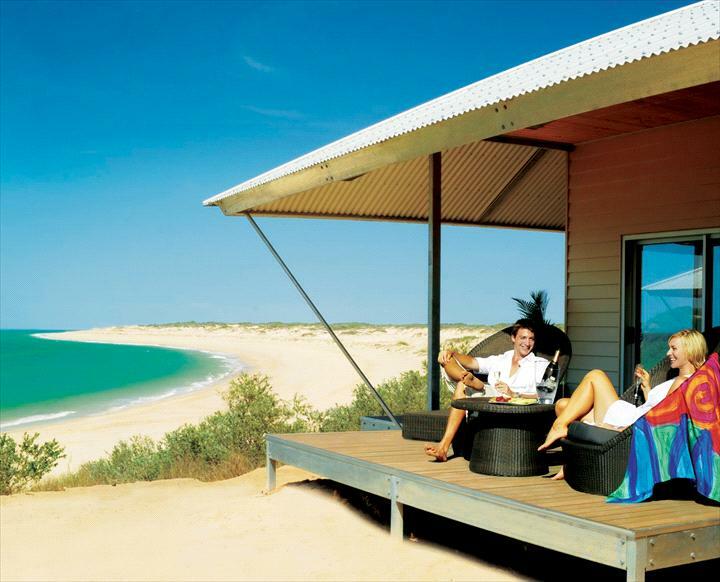 Just over an hour's drive south of Broome, the property offers guests a perfect parallel of Kimberley bush and beach. Accommodation at our eco resort provides guests with an unforgettable and unique wilderness experience whilst having minimal impact on the surrounding landscape. The exceptional accommodation includes superbly appointed Eco Villas interlinked by over 1km of elevated wooden boardwalks and luxurious ensuited safari style Eco Tents. For larger groups we offer The Beach Houses, striking fully self-contained ocean front accommodation with amazing views of the Indian Ocean. Come play with nature with a range of unique activities and experiences, including whale watching tours (seasonal), nature walks and a range of ocean or land based fishing charters. Complimentary daily yoga is available in our breathtaking oceanfront venue, treatments and massages in our Day Spa or simply relax at our alluring infinity pool or in a hammock on the beach. With an amazing location overlooking the Indian Ocean, Jack's Bar & Restaurant offers gourmet cuisine and an extensive wine and cocktail list. The menu focuses on local produce with fruit and vegetables fresh from our own organic gardens. Ramada Eco Beach Resort provides a myriad of perfect backdrops for a unique wedding or conference venue. Ramada Eco Beach Resort is a multi award-winning eco resort set amongst the pristine and untouched Kimberley environment. 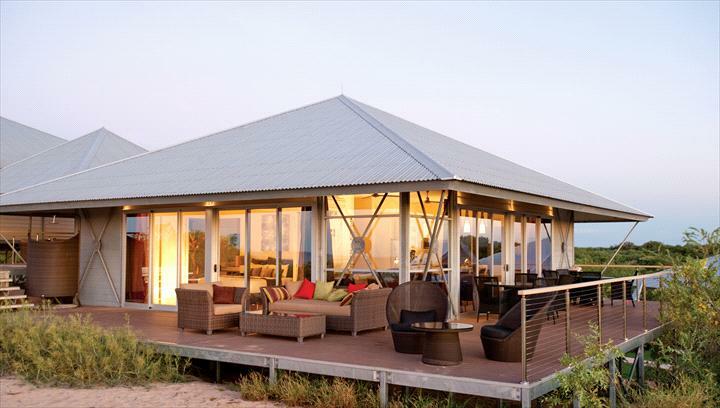 Just over an hour's drive south of Broome, the property offers guests a perfect parallel of Kimberley bush and beach. 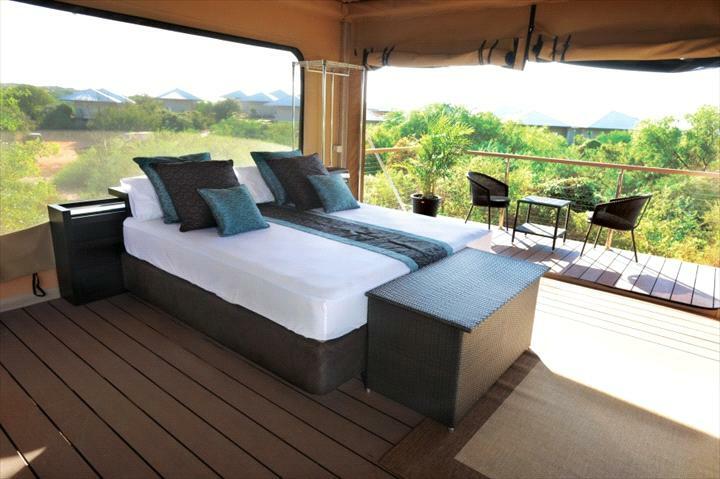 Choose from spacious ensuited safari tents, airconditioned villas or fully self-contained beach houses. Enjoy Resort facilities, oceanfront dining and a range of nature based activities. 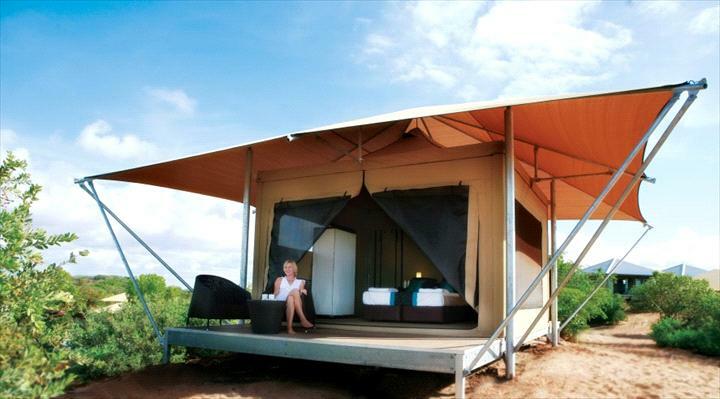 Our spacious safari-style Eco tents will bring you closer to nature whilst offering you comfort and convenience. Sit back and relax on the private front deck of your Eco Tent as you marvel at the natural beauty of Eco Beach�s surroundings. Eco Tents are positioned with views of our native gardens and are stylishly outfitted with a king size bed, ensuite shower & toilet, bedside tables with reading lamps; luxurious bed linen; wardrobe kit; large storage chest; pedestal fan and fly-screen ventilation.View of Eco Beachs surrounding native gardens and bushland. Spoil your loved one/s and yourself and enjoy the privacy, space and total comfort of your very own luxury Eco villa. Eco Villas are positioned with views of our native gardens. Thoughtfully designed to complement the natural surroundings, your air-conditioned villa features a king size bed in the main bedroom, a spacious open-plan living room equipped with a large leather sofa bed, a small bar fridge, microwave, toaster, kitchen sink, polished white stoned worktops, tea/coffee facilities and has the latest environmental design features, including solar power, bamboo floor boards, eco decking, louver windows, unique energy monitoring and more. Spoil your loved one/s and yourself and enjoy the privacy, space and total comfort of your very own luxury Eco villa. Eco Villas are positioned with stunning uninterrupted views of the Indian Ocean. Cots provided at no charge for infants under two years. Sit back and relax on the private front deck of your Eco Tent as you marvel at the natural beauty of Eco Beach�s surroundings. Eco Tents are positioned with partial views the ocean and are stylishly outfitted with a king size bed, ensuite shower & toilet, bedside tables with reading lamps; luxurious bed linen; wardrobe kit; large storage chest; pedestal fan and fly-screen ventilation.View of Eco Beachs surrounding native gardens and bushland. Spoil your loved one/s and yourself and enjoy the privacy, space and total comfort of your very own luxury Eco villa. 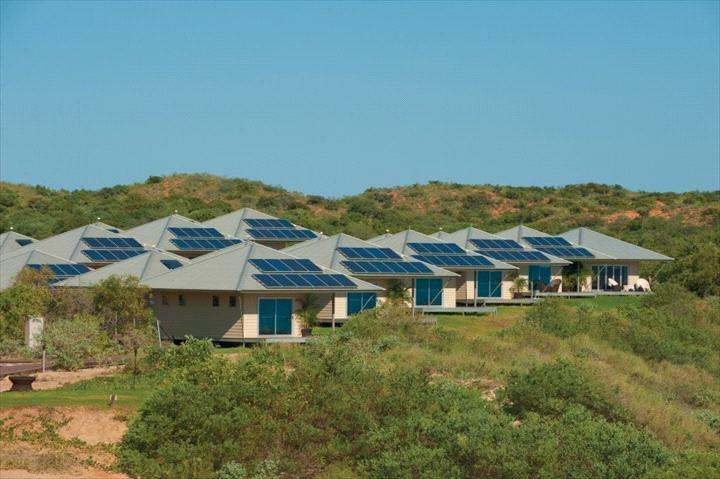 Eco Villas are positioned with partial views of the Indian Ocean. Perched on the headland with uninterrupted stunning Ocean Views this 2 bedroom luxury air conditioned Eco Villa comes with King Size bedroom, second bedroom, lounge area with fridge and tea and coffee making facilities. Accomodation bookings must be cancelled at least 1 week prior to arrival to avoid one night cancellation fee. Tour bookings must be cancelled at least 24 hours prior. 100% cancellation fee applies.